To commemorate the 35th anniversary of the Apollo 15 space mission, Omega is proud to present the Speedmaster Apollo 15 35th Anniversary, which combines features of the original Moon Watch ─ the first and only watch worn on the moon ─ with new features. This limited edition consists of 1,971 watches, in honour of the year of the mission. The 1861-calibre chronograph, with its manual-winding movement, has a power reserve of 48 hours. The dial is black with red-gold hour markers and SuperLuminova luminous dots. The red-gold hands are also SuperLuminova-coated. The Speedmaster Professional Moon Watch Apollo 15 has three recessed, two-tone counters: the 12-hour counter at six o’clock, the 30-minute counter at three o’clock and the small seconds counter at nine o’clock. All have stylish red-gold surrounds that match other features of the watch. The 18-carat red-gold bezel has a black aluminium ring with a tachymetric scale. The 42 mm diameter case is of polished and brushed stainless steel with 18-carat red gold push buttons and crown. The sapphire crystal case back is etched with the special Apollo 15 patch, featuring three stylized birds representing the three astronauts of the Apollo 15 mission – Commander David R. Scott, Alfred M. Worden and James B. Irwin. 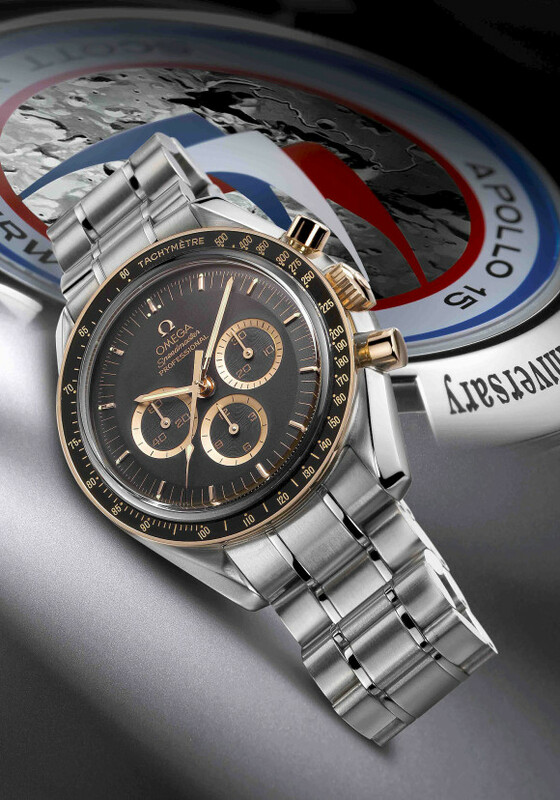 The case back is engraved with the words “Apollo 15” and “35th anniversary”, as well as the number of the limited edition and the Omega logo in black. The Speedmaster Professional Apollo 15 is water-resistant to a depth of 50 meters (167 feet). The sold-link bracelet with the special Omega safety clasp is made of brushed and polished stainless steel. The Speedmaster Professional Moon Watch Apollo 15 is supplied in an elegant, matt silver wooden gift box lined in black. This striking silver and black box sets off the silver and black features of the watch. The box features the special Apollo 15 patch and the Omega logo in silver. On March 1, 1965, following two years of rigorous testing, the Omega Speedmaster was chosen by the NASA as the only chronograph to be flight-qualified for manned space missions. It had been the only chronograph to successfully complete the American Space Agency’s stringent tests that included exposure to extreme temperatures, vacuums, intense humidity, corrosion, shocks, acceleration, pressure, vibrations and noise. The Omega Speedmaster was officially worn for the first time on the Gemini 3 mission, launched later that month on March 23, 1965. The Omega Speedmaster, known universally as the Moon Watch, became the standard issue for all American astronauts and was the first watch to be worn during an EVA – Extra Vehicular Activity — (outside a spacecraft). It remains the first and only watch worn on the moon when history was made on July 21, 1969. Apollo 15 was the second longest of all the Apollo space missions, taking 12 days, 17 hours and 12 minutes, and the first to use the Lunar Roving Vehicle (LRV), a car-like vehicle that carried scientific instruments for deployment on the Moon and gave the astronauts extended range for exploration. David R. Scott and James B. Irwin covered 27.9 km in the LRV and returned with one of the prize trophies of the Apollo program — a sample of ancient lunar crust named the “Genesis Rock”. Since it was originally launched, the Speedmaster has secured a truly illustrious reputation as an invaluable partner in the field of space exploration. To commemorate the 35th anniversary of the Apollo 15 mission, Omega has produced a Limited Edition model of 1971 timepieces. This exclusive Moon Watch retains the traditional characteristics of the Speedmaster Professional chronograph with the addition of the Apollo 15 patch etched on the case back. 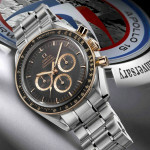 This entry was posted in Press Release, Speedmaster Professional and tagged Apollo 15, Limited Edition, Moonwatch on July 14, 2006 by Dale Vito.